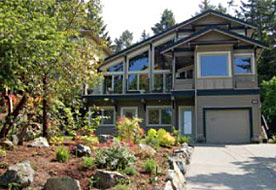 Brentwood Lighthouse Bed and Breakfast is a west coast contemporary home; custom built for privacy and quiet comfort. Serenity is our keynote but we are just twenty minutes from downtown Victoria and from all ferry terminals and Victoria Airport. Our two luxuriously appointed B&B guest suites both have ocean views, private entrances, a king bed and full ensuite bathroom with soaker tub and shower. Amenities include free Wifi, in-room coffee machine, fridge. We serve breakfast overlooking Brentwood Bay featuring local specialties and seasonal harvest. Relax in the tranquility of the bed and breakfast garden and watch the eagles soar while listening to songbirds in this bird watching paradise. A handy B&B location for Butchart Gardens, Victoria attractions. The Butchart Gardens is just minutes away, within walking distance. Brentwood Bay is on the pleasant Saanich Peninsula with restaurants, wineries, hiking, golf courses, beaches, kayaking and whale watching all nearby. Wander around the quiet town of Sidney: shops, restaurants, wharf. Our quiet B&B oasis provides a central peninsula location where you can relax and unwind after visiting Victoria attractions. (Downtown Victoria with its Inner Harbour, Royal BC Museum and shopping is less than 30 minutes away.) A short drive takes you to explorations of the natural beauty of southern Vancouver Island. See us on TripAdvisor where one guest wrote "I will return again and again to Brentwood Lighthouse as this was the most restful holiday of my life. Thank you to both of you!" Your Victoria BC bed and breakfast hosts: Nancy & Allan Adams. Now in our 11th year as a Victoria B&B near the Butchart Gardens. All content is the property of Brentwood Lighthouse B&B accommodations, Brentwood Bay, Vancouver Island, Canada.